Line up and get ready to use your mind! 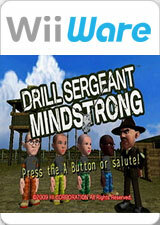 Drill Sergeant Mindstrong is a party game that allows up to four people to play at once. Players will become boot-camp trainees under the tough Drill Sergeant Mindstrong and go through mind-boggling, mind-strengthening training games. The rules are simple, but concentration and quick thinking are both key to playing this game and emerging as lean, mean, thinking machines. Become the top boot of your class and earn promotions based on your efforts! This game is best played with friends and family. The graph below charts the compatibility with Drill Sergeant Mindstrong since Dolphin's 2.0 release, listing revisions only where a compatibility change occurred. This page was last edited on 13 January 2018, at 07:07.